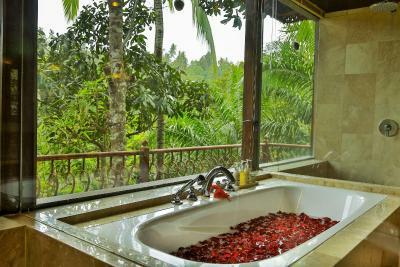 Lock in a great price for Ayung Resort Ubud – rated 9.3 by recent guests! The breakfast was amazing, the pool area with the jungle views was breathtaking and the nature around was very nice. Everything. It was amazing. Great staff, great views, great food. 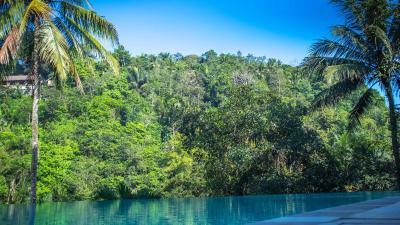 Great and silent swimming pool, with perfect view to the jungle. Delicious restaurant. Well thought complex overall. The staff was exceptional, the best trained staffed I’d come across in any of the hotels we stayed in in Bali. The property is very large with a way to get down to the river. It is exceptionally gorgeous with the owners art collection. Hotel territory is absolutely breathtaking! It feels like you're in Indiana Jones movie, walking through lush vegetation. The food is great. We spent our anniversary there and felt really special. 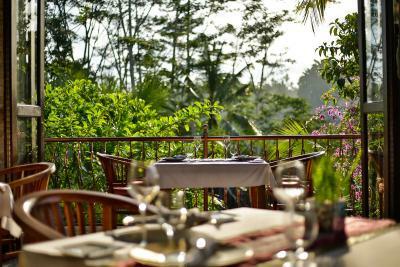 We think that location of this hotel is the best in Ubud, stunning views of the river look even surreal. All staff members are extremely friendly and helpful. Lost paradise found. sad to leave. The food was fantastic, as was the service. Rooms were cleaned and freshened multiple times per day. We had an issue where the tub wouldn't drain and it was fixed quickly. Grounds are fascinating with lots of artwork. Pool was large and clean. Minibar was restocked for free and afternoon tea was a delight. I also was able to run through the countryside near the hotel - it was really scenic. As I mentioned above, we really didn't want to leave. This hotel is AWESOME! We loved the serenity and calm. The staff go above and beyond to make your stay enjoyable and relaxing! The location is about 30 minutes from Ubud, so prepare for that but the shuttle service for free to town is nice to have activities during the day! The food is also delicious, ESPECIALLY the free breakfast! it is really like a heaven in the forest, clean and very helpful staff understanding and speaking english very well. the restaurant is also very great. Ayung Resort Ubud This rating is a reflection of how the property compares to the industry standard when it comes to price, facilities and services available. It's based on a self-evaluation by the property. Use this rating to help choose your stay! 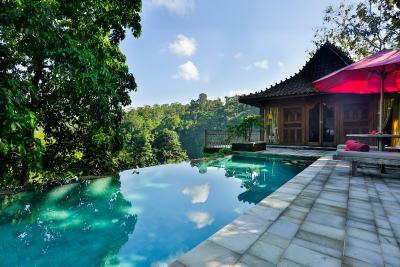 Ayung Resort Ubud offers a tropical retreat with free yoga classes and an outdoor pool surrounded by lush greenery. It also houses a gym, bar and a restaurant and provides free WiFi throughout the premise. Guests enjoy daily afternoon tea and daily replenished mini-bar. 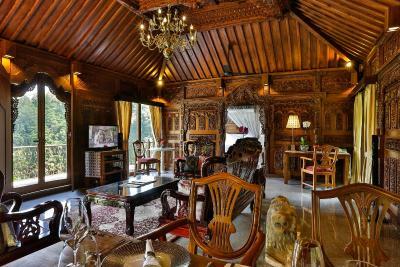 Ayung Resort Ubud is a 30-minute drive from Ubud Market, Ubud Palace and Monkey Forest. 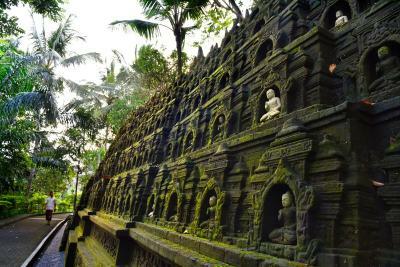 Guests enjoy free scheduled shuttle service to central Ubud. Ngurah Rai International Airport is a 1.5-hour drive from the property. 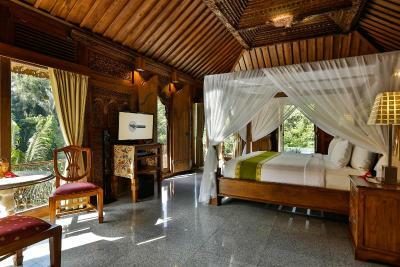 Each Balinese-inspired room comes with a private balcony overlooking the gardens. Air-conditioned rooms are furnished with wooden fitting and marble flooring. They come with a flat-screen satellite TV, fridge, and free mini-bar. Equipped with free toiletries, the private bathroom provides bath and shower facilities. Offering sightseeing arrangements, the resort operates a 24-hour front desk with luggage storage facilities. Staff can assist with airport pick-up arrangements at a charge. Daily breakfast, local specialties and international menus are offered at Wijaya Kusuma Restaurant. In-room dining is possible with room service. 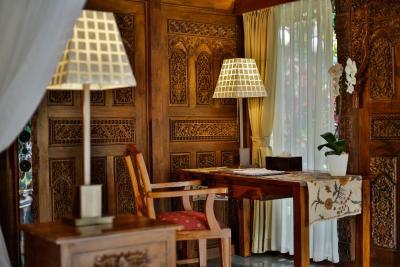 When would you like to stay at Ayung Resort Ubud? Enjoying views of the pool, this room includes a 32-inch flat-screen satellite TV and a fridge. Private bathroom comes with a shower, bathtub and free toiletries. Offering an additional space and views of the valley, this room includes a 32-inch flat-screen satellite TV and a fridge. Private bathroom comes with a shower, bathtub and free toiletries. 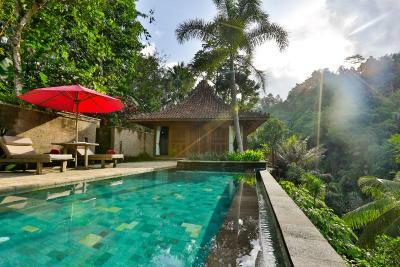 This 194-sqm one-bedroom villa is also called Rumah Kudus Suite Villa. It comes with a spacious and romantic bedroom equipped with a plush KingKoil bed with fine bedding, goose down pillows and a feather down comforter. Guests enjoy a private balcony, a private pool and a pool deck. Entertainment features including 42-inch flat screen Smart LCD home theater with international satellite channels, a DVD/CD sound system and free WiFi. This spacious and air-conditioned suite features traditional carvings with a living room fitted with a large flat-screen satellite TV and DVD/CD player. The bedroom comes with a plush bed and a luxurious private bathroom featuring his and her separate vanity. Garden view can be enjoyed from the room. This air-conditioned two-bedroom villa has traditional carving decor and it offers a big space with living room fitted with large flat-screen satellite TV, DVD/CD player, and sound system. Each bedroom features large bed and luxurious private bathroom with bath and shower facilities, slippers, hairdryer, and free toiletries. The beautiful Ayung River view can be seen from the room. Elegantly decorated with hand-carved wooden furnishings, this spacious villa offers a private pool, a living area fitted with a large flat-screen TV as well as a home theater system, and large outdoor terrace/balcony. This room includes a 32-inch flat-screen satellite TV and a fridge. 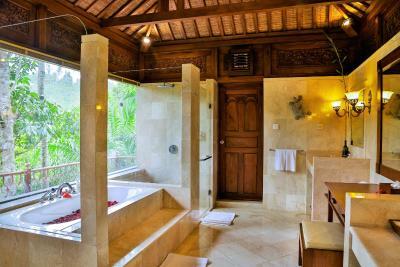 Private bathroom comes with a shower, bathtub and free toiletries. 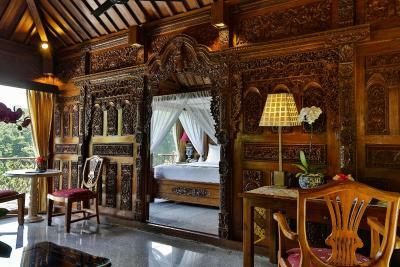 This spacious and air-conditioned suite features traditional Balinese carvings with a living room fitted with a large flat-screen satellite TV and DVD/CD player. The bedroom comes with a plush bed and a luxurious private bathroom featuring his and her separate vanity. Garden view can be enjoyed from the room. Guests enjoy one-time, 60-minute Balinese massage for 2 people. This 94-sqm one-bedroom garden suite offers fine furnishings, marble finished bathroom and a fine furnished living and dining room. Bedroom is fitted with a king size bed with 400-thread count linen, goose down pillows and feather down comforter. Private bathroom comes with a hairdryer. The unit has air conditioning, 32-inch LCD Smart TV with international satellite channels, free WiFi, and a personal safe. This 93-sqm suite offers beddings with goose down pillows and feather down comforter. It features a large private bathroom, fine furnishings and luxury marble bathroom. It's fitted with a 42-inch flat-screen Smart LCD TV with satellite channels and home theater, as well as DVD player and sound system. Guests enjoy view of the valley. Breakfast can be served in the suite at an extra charge. House Rules Ayung Resort Ubud takes special requests – add in the next step! One older child or adult is charged IDR 650000 per person per night in an extra bed. Ayung Resort Ubud accepts these cards and reserves the right to temporarily hold an amount prior to arrival. Wish we’d had more days - 4 were not enough to properly enjoy the resort as well as all the activities the the area had to offer. Personable customer service with attention to detail and always a a warm smile - from the friendly staff picking you up on the buggy (the resort is built on a slope, and though you can go in foot...sometines a ride saves time ;-) ; to the restaurant staff; to the reception Desk. A warm thank you to Makong, Krishna and Yogi, as well as the lovely ladies from the Spa and the gentle waiters from the restaurant. The grounds are well maintained and well kept; the rooms are relaxing, with great views overlooking the jungle foliage I won’t tell all the details because that would spoil the pleasure of discovery if you choose to be a guest here. I know we will return here on our future trip to Ubud in a few years’ time. Special thank you to Yogi for organizing our transportation to Nusa Lembongan. Maybe the cleanliness as the bed sheets weren’t changed for the three days we stayed. The wonderful rain forest location and the continually smiling staff. The ability of staff to remember names and take meal orders for 5 without takng notes and get it right! The staff were amazing and the place was beautiful, very scenic. Hotel facilities, service and staff were amazing! Could do with a free shuttle into Ubud in the evening. Great smiling staff. Excellent food. Our villa with pool fantastic. Location in rainforest beautiful. Nice hotel located in very quiet place. Restaurant’ staff tries a little too hard. They should monitor if you need something from a distance, not by asking if “everything’s ok?” every two minutes.